Home > Cycad Species > Dioon Species > Dioon edule var. "Queretaro Blue"
Dioon edule, variety "Queretaro Blue", grows in the Mexican state of Queretaro, at elevations exceeding one mile, resulting in cold hardiness well below 20 degrees Fahrenheit. Its leaves are a glaucous/blue color, with a slight twist, curving slightly inward. The leaflets of Dioon edule, "Queretaro Blue" are spineless, smooth and pointed, with slightly revolute margins (edges turned under). Full sun exposure will cause a more blue leaf color. The Queretaro Dioon grows well in both container and garden. Good drainage is important for this plant. 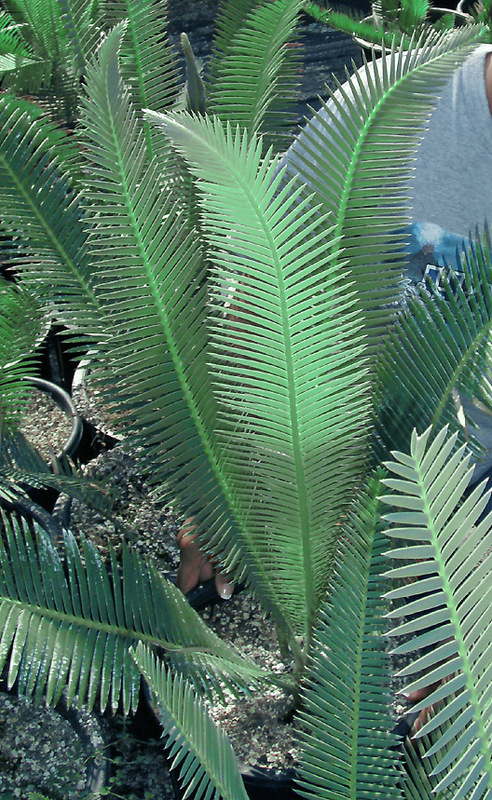 This Dioon edule complex is a group of of flat-leafed, sun-loving plants popular for their tolerance of heat and cold and attractive, stiff, blue- to gray-green colored leaves. They grow best in part to full sun.